The program concentrates on group skill development that involves physical and emotional risk and the opportunity to succeed within a supportive group atmosphere. Our Low Ropes Course is comprised of over 30 different elements including a series of challenges using props such as; wooden platforms, boards, ropes and cables designed for group participation regardless of physical limitation and ability level. Participants develop skills in problem solving, communication, decision making, trust, as well as a strong sense of self-worth and accomplishment. 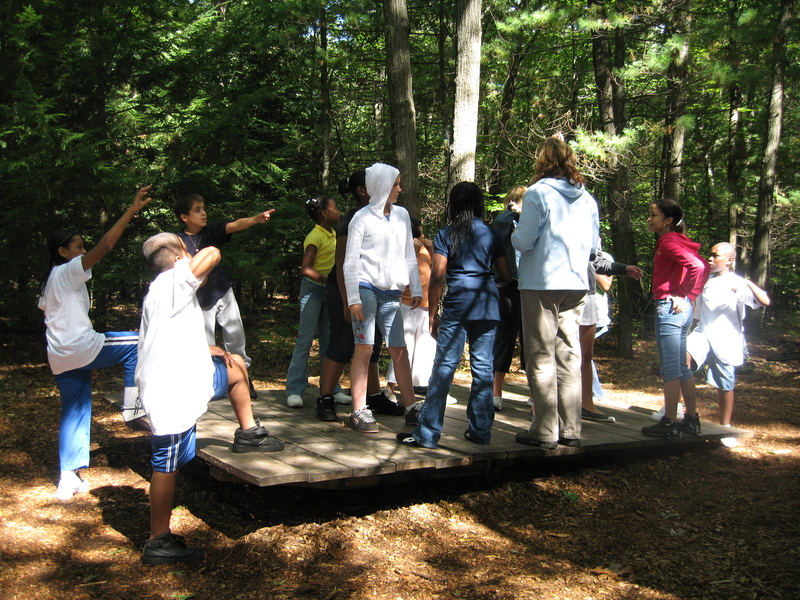 Typical Low Ropes Program… the first ½ hour to 45 minutes participants will engage in small/large group games. This will give the participants and staff members an opportunity to get-to-know each other and talk about expectations of the day. The next 3.0-6.0 hours participants will learn to work with their group on our low elements. Try something new while testing your skills and buoyancy. This is a great group activity to work on communication and leadership. This challenge will break up into teams and attempt to build the perfect craft to carry your team out onto Dunning Lake and back. Typical Program…. the first ½ hours to 45 minutes participants will engage in small/large group games. This will give the participants and staff members an opportunity to get-to-know each other and talk about expectations of the day. The next 45 minutes to an hour participants will learn to work with their group on our low elements. This will help the group to work together and establish a working relationship which will be needed when we move to raft building. Finally, during the last 2.5-4.0 hours participants will build and sail their rafts. Participants will have the opportunity to interact with their teammates in a very different and powerful way. Our facilitators establish context for the program and help your group recognize valuable insights throughout the day. Our High Ropes Course is comprised of 7 different elements that are 30-50 feet up in the trees so the perceived risk is high, but actual risk is low. Through this program participants will overcome personal fears; develop new self confidence and trust as well as a strong sense of self-worth and accomplishment. Typical High Ropes Program… the first ½ hours to 45 minutes participants will engage in small/large group games. This will give the participants and staff members an opportunity to get-to-know each other and talk about expectations of the day. The next 45 minutes to an hour participants will learn to work with their teammate on our low elements. This will help the group to work together and establish a working relationship which will be needed when we move to the high rope elements. Finally, during the last 2.5-4.0 hours (depending on the group size)-participants will play in the trees. There students will learn how to work with one other under pressure and learn to deal with expected challenges. The group will have the opportunity to rotate between 1-3 high ropes elements.